Everyone’s human rights should be respected. Citizens and recent immigrants alike want safe communities, and police are increasingly adopting new tools and strategies to ensure public safety. Our laws and practice should reflect our commitment to human rights as a nation. Yet, some immigrants experience mandatory detention, racial profiling, and due process violations because of laws and policies that violate their human rights. There is a severe lack of due process for immigrants in detention. Mandatory detention and lack of discretion for immigration judges to grant bond has resulted in immigrants being held in detention for lengthy periods of time without any progress or change in their cases. Such laws and policies violate the principles of equal justice, due process, and proportionality under our criminal justice system. It is important to remember that crime has gone down in cities like Phoenix and New York in periods during which immigrants were moving there, indicating that immigrant families often add stability to neighborhoods. Policies should ensure that we all have our due process rights respected and that law enforcement agents are bound by the dictates of the law. 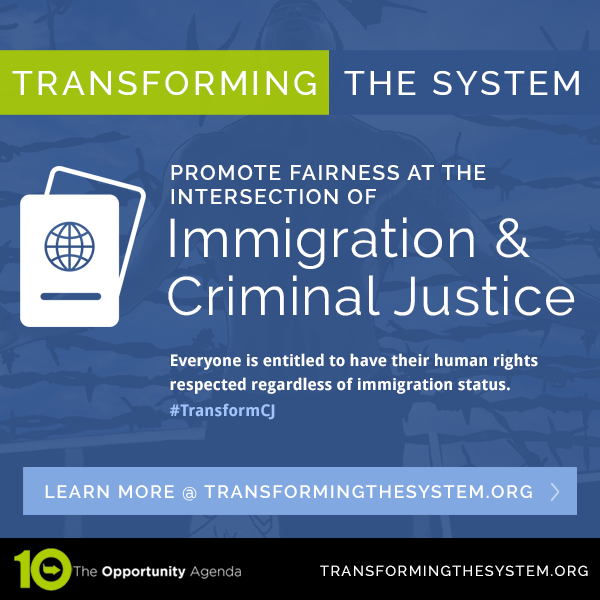 Lawmakers should renew our commitment to international human rights; eliminate unworkable collaborations between local law enforcement and immigration authorities; protect the human rights of families and children who migrate; eliminate the expansion of exclusion based on aggravated felonies; eliminate the use of detention for immigration-related matters; stop deportations; and provide individuals in immigration proceedings access to lawyers. Immigration and Customs Enforcement agents, Customs and Border Patrol agents, police officers, and other law enforcement officers working in the border region should receive regular training in human rights, including civil rights, ethics, and community relations. Training should also be given on Fourth Amendment protections against illegal searches and seizures as well as Fourteenth Amendment prohibitions on racial profiling and on stereotyping and implicit bias. Additional training should be provided that deals directly with the obligation to protect and provide due process to victims of crimes, trafficking, and domestic violence, amongst others. Changes must be made in how child migrants and families who cross the border into the United States are treated, especially since there has been an increase in family detention and in children and families being put on a fast track to deportation without any legal representation. The use of family detention needs to end and alternatives should be utilized. Ensure that children are not exploited or abused in custody; there needs to be greater oversight and accountability to prevent shackling, inhumane detention conditions, verbal, physical, and sexual abuse, amongst other violations. The “best interests of the child” standard should be required in all procedures and decisions involving children. Congress should provide a a right to counsel in all stages of immigration enforcement actions and proceedings. This should include phone and in-person access by attorneys and child advocates. Legal counsel should be provided for all children in removal proceedings and children should be provided with information about their legal rights. DOJ should ensure that civil society has access to and can monitor Customs and Border Patrol’s facilities. Oversight should include a transparent, uniform system to process complaints. Non-governmental organizations should be able to monitor Customs and Border Patrol’s detention centers as well as have access to detained immigrants for interviewing purposes. Independent oversight organizations should have the power to hold agents who abuse their power accountable. Congress should change the definitions of conviction and aggravated felony in immigration law to be consistent with current federal and state criminal laws. An immigrant who is convicted of an aggravated felony faces mandatory detention and likely deportation; aggravated felonies also permanently bar lawful and non-lawful permanent residents from applying for asylum, naturalization, cancellation of removal, and voluntary departure. The definition of aggravated felony has broadened to include offenses that are neither felonies nor aggravated under criminal law definitions. The definition of aggravated felony should reflect the common understanding of fairness under the criminal justice system. All bars to entry based on prostitution should be eliminated. Policy changes should be made as to how border communities are handled so that human rights, due process, and safety in border communities is upheld. Customs and Border Patrol officers should be held accountable for the abuse of their power, especially when it includes the use of deadly force. Their practices amount to civil and human rights abuses. There should be oversight and enforceable custody standards to stop the cruel, degrading, and other ill-treatment of detained individuals. Customs and Border Patrol agents that commit acts of deadly force, excessive force, and other crimes should be prosecuted and punished. Congress should fix the 1996 immigration laws, by repealing Illegal Immigration Reform and Responsibility Act (IIRAIRA) and the Anti-Terrorism and Effective Death Penalty Act (AEDPA), and eliminating mandatory detention for immigration-related matters. Enforcement programs which share data between state and local law enforcement and the FBI and Department of Homeland Security lead to racial profiling, as well as erroneous arrests, which destabilizes the relationship between immigrant communities and police. These programs should be terminated. 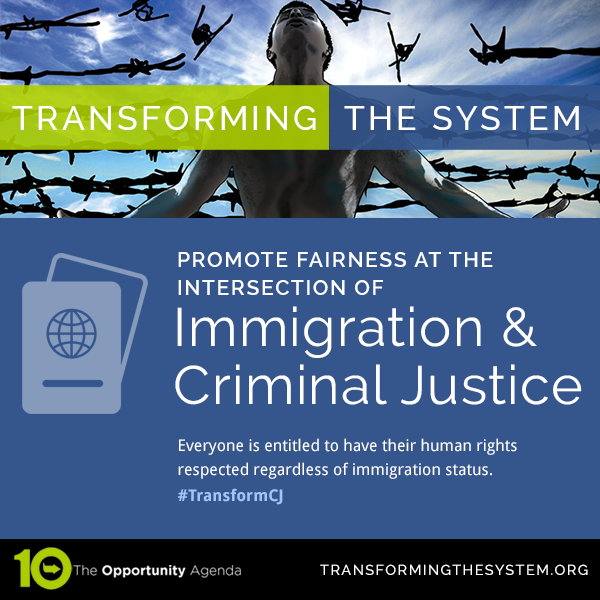 Immigration enforcement is not a criminal justice matter, but instead a civil process. Local law enforcement should not be allowed to collaborate with Immigration and Customs Enforcement. Immigration enforcement practices should be reviewed through an international human rights scope, so that they follow human rights norms. This review should take the form of an independent review commission which also provides a complaint process for reporting human and civil rights violations. Furthermore, training should be provided to not only local and federal agents on human rights, but also to border communities, so they know about their civil and human rights. Officials should also be held accountable when they violate domestic and/or international human rights principles. We all make mistakes. But most Americans believe that people deserve a second chance, and that most mistakes shouldn’t be allowed to ruin our lives, and the lives of everyone around us. But our criminal justice system does ruin the lives of many immigrants who come into contact with it. Even if you’ve lived here for years, you can be deported if you’ve been accused of a low-level offense like shoplifting. Many immigrants in the system don’t get access to lawyers, and thousands are detained for indefinite amounts of time with no hearing. There’s no question that we all should be held accountable for our actions, but removal from the country or indefinite detention is a clear example of the punishment simply not fitting the crime. We need to re-examine how our justice system treats everyone here, and align that with the values we hold dear. We need a fair system that makes sure we don’t punish people without a hearing or access to lawyers. Those rights are central to our values. Urge Congress to change the definitions of “conviction” and “aggravated felony” in the immigration law to be consistent with current federal and state criminal laws; remove prostitution-related barriers to entry; de-criminalize the immigration system by repealing the 1996 laws; and restore discretion and due process for all individuals who come into contact with the criminal justice and immigration systems. Our former Communications Institute Fellow, Christian Ramirez, in the Director of the Southern Border Communities Coalition, which works to protect human rights and accountability at the border.